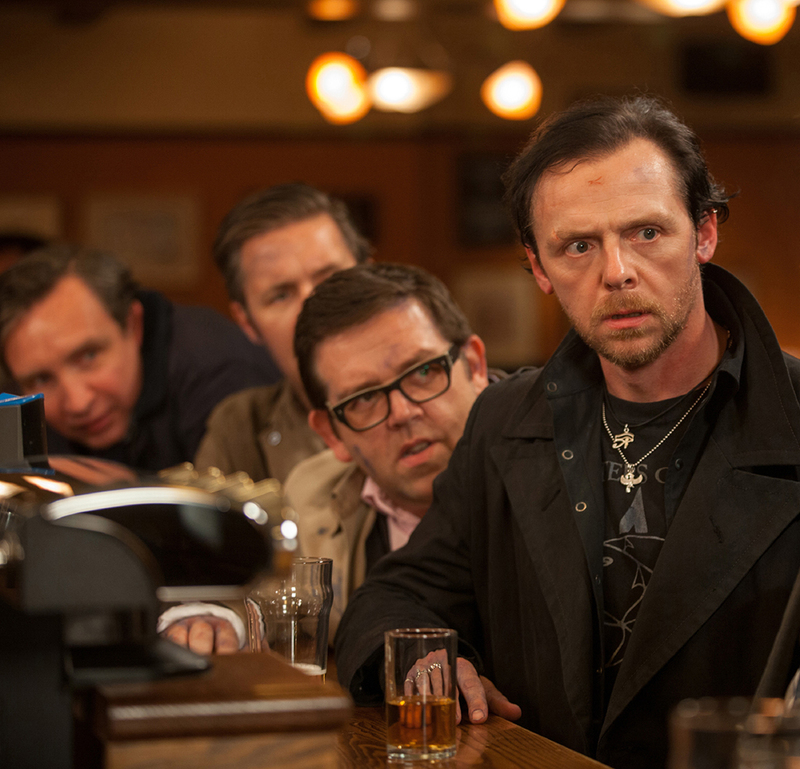 Nick Frost (left) and Simon Pegg (right) in ‘The World’s End’. After establishing themselves in the UK in the late ’90s with the cult-classic sitcom Spaced, writer-director Edgar Wright and his perennial co-stars Simon Pegg and Nick Frost snuck onto the world stage with the zombie rom-com Shaun of the Dead in 2004 and the action movie spoof Hot Fuzz in 2007. Since then, Wright put the eccentric comic book movie Scott Pilgrim Vs. the World under his belt and will soon direct Marvel’s Ant-Man, while Pegg landed recurring roles in the Mission: Impossible and Star Trek franchises and Frost played a dwarf in Snow White and the Huntsman (both actors also appear in the animated The Adventures of Tintin and the sci-fi comedy Paul). The trio recently re-teamed for The World’s End, the final film in their unofficial trilogy. A mash note to some of their favorite sci-fi flicks it stars Pegg as Gary King, a social drop-out who never outgrew his teenage years, who convinces his four childhood friends (Frost, Martin Freeman, Paddy Considine, and Eddie Marsan) to return to their hometown to complete the epic all-night pub crawl they failed to finish in their teens. Most are reluctant, but all join in. The already tense evening takes a turn when they inadvertently discover that the town seems to have been taken over by extraterrestrial invaders. Movie Ink: Well, I’m kind of afraid to. You guys have seriously freaked me the hell out. But it was already in the back of my head, the notion of going to one’s hometown and seeing people you haven’t seen in years and realizing that kind of now them but you’ve outgrown them, and things like that. You guys really hit those feelings on the head, or maybe it was just me and where I was at. I was wondering what you drew upon, if that was something you were consciously approaching. Wright: I think it’s something that happens to us a lot. Me and Simon both are from small towns, Nick lived in a small town for a while in Wales, so we’ve all had that experience of going back – and different things happen. There are some friends that you completely connect with immediately, there are some friends that you connect with after you’ve had a couple of beers when everyone sort of falls back into that hierarchy, or there are some friends where you have nothing in common anymore and you’re only linked maybe by a silly gag that you had when you were 12, and of them has to remind the other what the gag is. So yeah, that sort of happened to me. There are lots of things in the movie that in some ways have happened to me or Simon, like the thing with the bully; that story is kind of two different part of real incidents. I had an incident were I ran into a school bully and he didn’t recognize me, and it annoyed me more. The fact that he blanked me kind of made me mad. A lot of those things come into it, and it’s such a bittersweet feeling to go back. And on top of that, beyond just the people, is the fact that the town has changed in the same way that you’ve got your megastores that wipe out the ma and pa stores all over the country, exactly the same thing happens in the UK and what you see in the film is the idea that the chains have taken over. But then on the flipside… the question is “Was the coffee any better in the ma and pa diner or is the Starbucks coffee any better?” Unfortunately, sadly, it’s probably the latter, but you eulogize the ma and pa diner because it looked beautiful, and you liked the staff there, and it felt kind of homey and folksy. 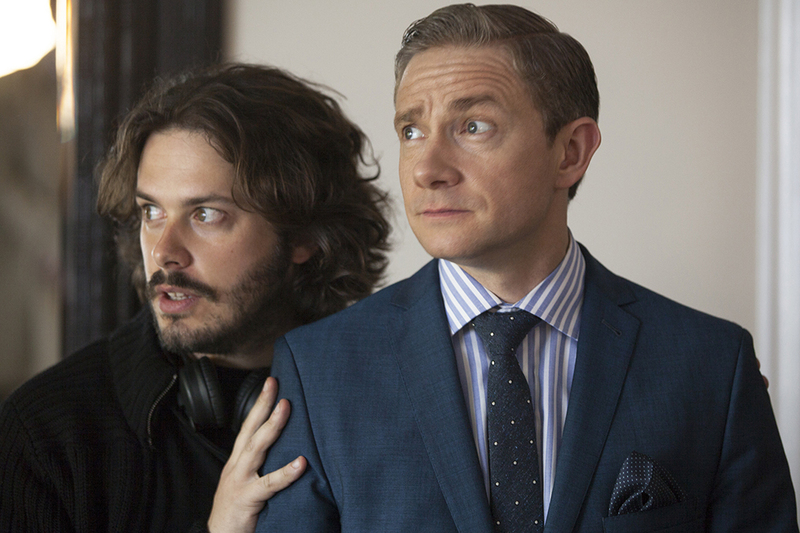 Edgar Wright (left) on the set with Martin Freeman. Gary is kind of seen as pathetic for trying to be the school rebel forever, but are the other characters robots who’ve settled into their jobs? So we’ve tried to sort of bring all those feelings about, and where people are at certain stages where people have settled into being husbands and fathers, but Gary was happiest at 18 and he wants to go back there. Pegg: Oddly, one of the initial concept designs for the bad guy in the movie, was this sort of an intergalactic Facebook, this homogenizing force, but it became more complex than that. Through Facebook, though I’m not on it now, I did meet up with a bunch of old friends and we organized a night out, and it was a lovely night. We talked about the past, and we caught up, and we never ever did it again, and it’s because that’s all we had. There’s that thing, you know, where you can’t have a friendship which exists on nostalgia alone, because you have to move forwards a friends, you have to evolve. We all have, the three of us have over the years. Going back and meeting all those people was educational, because I remember loving them dearly when I was 16 and I kind of still do, but there’s no real forward moment in that. There’s a great sort of sense of desperation when you’re trying to find some sort of common ground other than something you did when you were 16 and there isn’t any, and it’s kind of depressing you know. Frost: I’m from a small town in Wales and I lived there when I was 12 or 13 for a time. I think it would have been different if I had grown up there, but going back I kind of felt like Brad Pitt in 12 Monkeys. I could walk around in like a plastic suit and just watch really. Even though I only went back every summer it felt like when you see time-lapse photography of when you see a bowl of fruit decaying. It always made me feel really sad that everyone would rather just be there because that’s what they know. It’s easier to do that than say “Well, I’m going to move to the city” or “I’m going to move to the beach”. You could always tell how much time has past by how many teeth people had lost. That’s why I don’t go back. I don’t know anyone from school. I lived in Israel when I was 18 and… I think of that fondly and that’s the only time apart from now with my friends and my wife and my baby. I’m all about going forward.